Luckily for Airbnb, its rise coincided with a steep increase in city tourism. Luckily for Airbnb, its rise coincided with a steep increase in city tourism. In cities such as London, Paris or New York, where hotel rooms are often hard to find and/or expensive, Airbnb has become an affordable and popular way to experience cities in a less touristy way. While the platform has been opposed by the hotel industry pretty much from the start, it has also drawn a fair amount of criticism from residents of popular city trip destinations for exacerbating the shortage of affordable housing in many areas. A criticism that doesn’t seem entirely unfair, considering the number of objects listed in some cities. 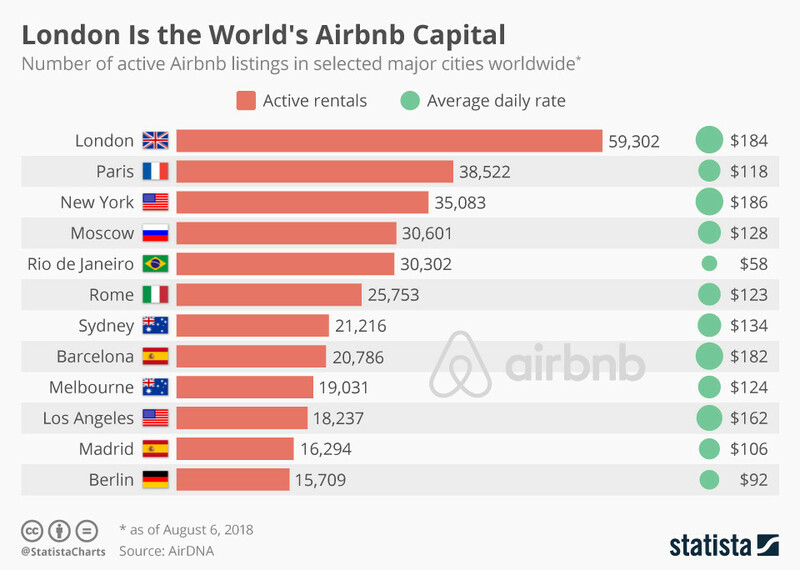 The following chart, based on data from AirDNA, shows which cities are particularly popular on Airbnb.